The first one is the hardest – For the Detroit Red Wings, it's one down and 15 to go. But the "one" wasn't easy. 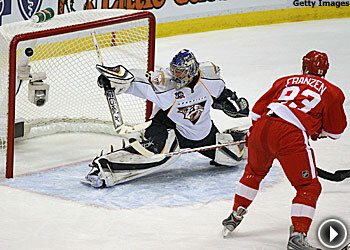 The Wings had to work hard to beat the Nashville Predators, 3-1, in their playoff opener. Though the Wings outshot Nashville 40-20, they needed Henrik Zetterberg's goal with just over 13 minutes left to break a 1-1 tie. Zetterberg added an empty-netter with 19 seconds left. The Wings won the Presidents' Trophy as regular-season champions for the third time in four seasons and the sixth time since 1995 — but have just one Cup in those six seasons. Coach Mike Babcock felt there was a lot of pressure on his team in Game 1. ''The first one is the toughest to get, especially when you're at home and you've got more jitters than you'd think,'' Babcock said. "The first one is always very, very difficult. That's what the playoffs are about. Just try not to give up too much and wait for your opportunity." With one win in hand, the Wings will try to go up 2-0 when they host Nashville on Saturday afternoon in a game being televised nationally on NBC. They won't quit – The Predators lost several key players last summer, so it would be understandable if they were just happy to have made the playoffs. They don't see it that way — and a 3-1 loss to Detroit in Game 1 hasn't changed their mind. But it won't be easy. Not only will the Predators be facing the NHL's best team in the regular season, they'll be trying to win the first road playoff game in franchise history. The Preds have lost all eight postseason games away from the Sommet Center. Brotherly love – Talk about living up to your word. Montreal got the jump on Boston in its 4-1 win Thursday when the Kostitsyn brothers, Sergei and Andrei, scored in the first 2:02 of the game. Sergei said he was backing up a promise he had made to his brother. "I told (Andrei) before the game that I would score on the first shift,'' a beaming Sergei Kostitsyn said of his goal 34 seconds into the game. ''It felt great." He was even happier when his older brother finished off a pass from Tomas Plekanec 88 seconds later to give the Canadiens a 2-0 lead. ''Andrei scored, I scored. I'm happy for us both," Sergei said. The brothers from Belarus are the first siblings to score for Montreal in a playoff game since Frank and Peter Mahovlich, who did it against the Rangers in New York on April 14, 1974. Montreal defeated Boston again last night in a 4-1 win that gave the Habs a one game lead in their playoff series. Time to regroup – It's one thing to know what you're supposed to be doing on the ice. It's another to do it, especially at playoff time — and the Boston Bruins didn't. Having seen (and lost to) Montreal eight times in the regular season, the Bruins weren't surprised by the Canadiens in their playoff opener. But they were outplayed in a 4-1 loss at the Bell Centre. "We knew exactly what they were going to throw at us, we did the things that were supposed to prevent those kind of things, but somehow, I don't know if nervousness or whatever got in the way, but we didn't make the good decisions and it ended up costing us," Boston coach Claude Julien said. "We were just OK, and at this stage, OK's not good enough." Given that Montreal is 9-0 against Boston this season and 12-0 in their last dozen meetings, the Bruins will have to be a lot better than "OK" if they hope to get even in Game 2 Saturday night. Can't ask for more – Ever have one of those nights when everything goes right? The Dallas Stars did – and they picked the right time. The Stars scored four power-play goals and completely shut down the defending Stanley Cup champion Anaheim Ducks in a 4-0 series-opening victory. "We couldn't have drawn it up any better tonight," said Stars captain Brenden Morrow, who had the last of the four man-advantage goals. "We stayed disciplined and took advantage on the power play. I can't remember the last time we won Game 1 (of a series), but everyone contributed and played their roles. It was a huge confidence builder for us." The Stars were outshot 8-2 in the early going before Anaheim began a parade to the penalty box – and Dallas started to fill the net. The Stars got two power-play goals in the first period and two more in the second. The third period was played before a quiet crowd at Honda Center. Dallas, which beat Anaheim 5-3 in the season series, should be brimming with confidence for Game 2 Saturday night. "I think we had confidence coming in, but you earn that confidence," Dallas coach Dave Tippett after winning a series opener for the first time. "We know that we have the capabilities to win, and we had a solid effort throughout." Paying the price – The Anaheim Ducks are the NHL's most aggressive team, and they have the penalty minutes to prove it. But even the defending Stanley Cup champions can't afford many more games like Thursday's 4-0 loss to Dallas, in which they took 11 minor penalties, gave Dallas seven power plays and coughed up four power-play goals. "Our penalty kill really did not do a good job," Ducks defenseman Scott Niedermayer said. "There were a lot of things that weren't as good as they should have been. We did take some bad penalties. They seemed to find a way to score almost at will. We have to do better as penalty killers. We have to answer the bell better." The Ducks were thoroughly beaten, and the Stars now have the home-ice edge. But the defending champs hardly are ready to panic. "There's a reason why these games are best-of-seven," forward Teemu Selanne said. "Obviously, it was not pretty tonight, but we'll come back tomorrow, work on a couple of things and go from there. I want to see a hungrier team on Saturday." Remembering Warren – The late Warren Strelow, who died last year after tutoring a long line of NHL goaltenders, would have been proud of two of his pupils Thursday night. Evgeni Nabokov made a handful of brilliant stops in San Jose's 2-0 series-tying victory against the Calgary Flames. Another of Strelow's pupils, Calgary's Miikka Kiprusoff, stopped 41 shots in his second brilliant performance in as many nights. ''I'm sure Warren Strelow is upstairs with a big smile on his face,'' Sharks coach Ron Wilson said of San Jose's longtime goaltending coach. Nabokov is trying to even the score with his former teammate, who was the Flames' best player in their victory over San Jose in the 2004 Western Conference Final. 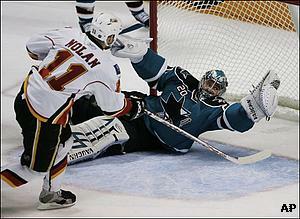 Calgary Flames right wing Owen Nolan is unable to score past San Jose Sharks goalie Evgeni Nabokov last night. Keenan complains – The Calgary Flames gave San Jose nearly 10 minutes of power-play time in the second period of the Sharks' 2-0 victory. Expect Flames coach Mike Keenan to give someone an earful in return. What Keenan also needs to do is find a way to slow down San Jose's big, speedy forwards. They pressured Calgary all night, and only a 41-save effort by goalie Miikka Kiprusoff kept the game close. The Sharks outshot Calgary 27-3 in the middle period.